One of the delights of working in a Regimental Museum is the unusual items that one comes across when cataloguing the collection. In this case it is an Iron Cross, First Class, from the First World War. This particular object was acquired by Major Jardine-Patterson during the Second World War, and later donated to the museum by him. The Iron Cross was established by King Freidrich Willhelm III of Prussia towards the end of the Napoleonic Wars and first awarded to recipients in 1813. The shape of the medal reflects the cross worn by the Teutonic Knights, officially the Ordo domus Sanctæ Mariæ Theutonicorum Hierosolymitanorum (Order of the House of St Mary of the Germans in Jerusalem) founded towards the end of the 12th century to assist pilgrims journeying in the Holy Land. Later on this knightly order crusaded in the pagan lands of northern Germany and Lithuania, and did much to establish the Kingdom of Prussia. The colours of the medal, black with two thin white lines, reflects this later history by echoing the national colours of Prussia. The medal is unusual in that it was not always in circulation. Rather it was created in the early 19th century, and then allowed to lapse, before being re-issued for the Franco-Prussian War (1870-71), The First World War (1914-18), and The Second World War (1939-45). The medal became strongly associated with Prussian militarism and in fact was the symbol for the unified German Army from 1871 to April 1918. The Iron Cross has a variety of levels associated with it, called Classes, starting with the Iron Cross Second Class, and going up to the Iron Cross with Golden Oak Leaves, Swords and Diamonds. These types of Iron Cross were awarded for bravery in the field, though there were other types awarded for outstanding generalship. All of the Iron Crosses, apart from the Iron Cross First Class, of which this is an example, were worn via a ribbon attachment. The Iron Cross, First Class, was instead pinned to the left breast of a uniform. Every post Napoleonic War Iron Cross has a date embossed on it allowing them to be assigned to a particular conflict. 1870 for the Franco-Prussian War, 1914 for the First World War and 1939 for the Second World War. 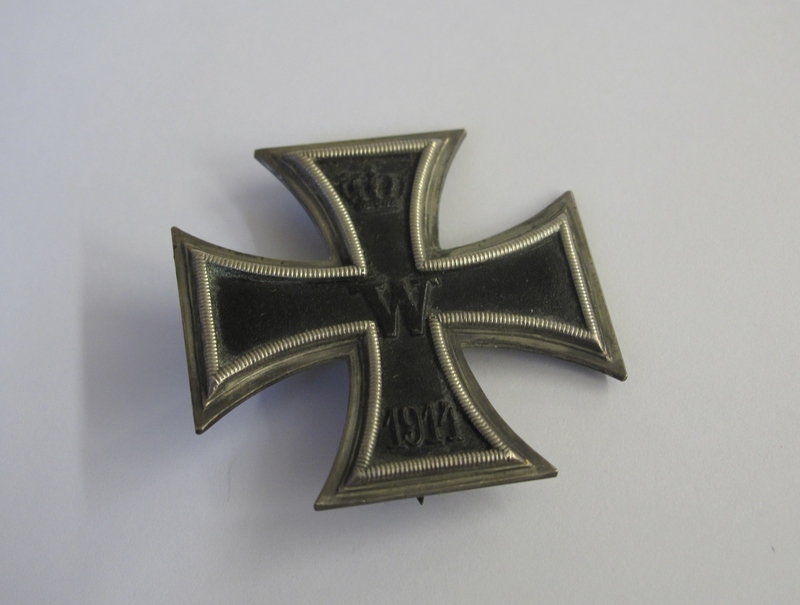 Sone 218,000 Iron Cross, First Class were awarded during the First World War though the exact number is uncertain due to the fact that the Iron Cross archives were destroyed during World War 2. This entry was posted in Artefacts and collections, Christmas, Second World War and tagged Black Watch, medals, military, museum, Second World War, The Black Watch, The Black Watch Castle and Museum, The Black Watch Museum. Bookmark the permalink.